At Weber Chiropractic, it is Taylor Chiropractor Dr. Erik Weber‘s goal to help you achieve the best quality of life possible. No one should have to change the way they live because of health concerns. We work on the philosophy that the power within your body heals your body. It is our goal to help you achieve optimum health by allowing that power to work at it’s full potential, which will in turn allow you to live the best life you possibly can. Here at Weber Chiropractic, we are excited to work with you on your chiropractic journey. Whether you are looking for pain relief to steady chiropractic treatments for wellness, you’ve come to the right place.We serve Taylor, Hutto and Williamson County patients who are looking for chiropractic care. Dr. Weber is an experienced, caring chiropractor in Taylor that is willing to listen and respond to patients’ needs and concerns. 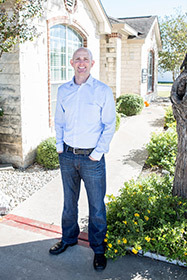 He’s well-versed in a variety of chiropractic techniques, including both manual and instrument-based methods. Take a look around our site to learn more about the chiropractic techniques we use and what to expect during your first, second, and regular visits. You can read some of our patient reviews to hear about the success others have found at our practice. You can contact our friendly, helpful to get answers to any questions or concerns you have, or to schedule an appointment. Very friendly! It’s enjoyable coming in to the office. Loved everything about visit. Brooke and Dr. Weber are very welcoming and knowledgeable. Dr. Weber provides extra information that is quite helpful. He listens and really cares about his patients. I recommend him without reservation! Dr. Weber listened very intently to my problems, answered all my questions, and eased my fears! Fantastic experience! Dr. Weber is so thorough in his evaluation with you. He’s so caring and so patient and he has such an awesome heart for his patients. Dr. Weber and his staff are professional, courteous and caring. I am pleased with their services. Very VERY impressed by the doctor and staff. They really made me feel at home. I can’t wait to receive treatment from this practice. Very knowledgeable in this field to be a great help getting myself back in good health. Many thanks! Most informative chiropractor I have ever been to, and he takes the time to know you, and your lifestyle, his staff is wonderful, I would recommend him to everyone. Very friendly and helpful. Would definitely recommend to anyone looking for help. Dr Webber is very patient with answering questions or concerns and makes sure you fully understand the problem as well as the treatment plan before you leave. He is very kind and compassionate. The Weber Chiropractic team is awesome and they really care about the quality of life of their patients. Absolutely wonderful. Very thorough, thoughtful and educational. My headaches are gone. Great and friendly staff! Very accommodating to our scheduling needs!